Self-catering Cottage with 0 bedrooms and 2 bathrooms. Sleeps 4. Saturday changeover. Self-catering Cottage with 3 bedrooms and 2 bathrooms. Sleeps 7. Saturday changeover. 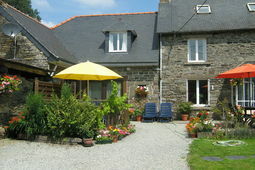 Self-catering Gîte with 7 bedrooms and 5 bathrooms. Sleeps 15. Non-applicable changeover. The Côtes-d'Armor (department number 22) is located in the region of Brittany with an estimated population of 542,300 (approximate in 1999). Situated in north west France, on the north coast of Brittany, the coastline is rugged with many steep cliffs and is dotted with medieval towns to visit. The capital of the department is the city of Saint-Brieuc. Known for the beauty of its landscape Côtes-d'Armor is also visited and well known for its beautiful cities and medieval towns. The Côtes d’Armor is the largest European producer of scallops. From early spring, you can see at a glance that in Côtes-d'Armor, the towns are bedecked with colourful window boxes and flower beds, benefitting not only the visitors but also the residents. Côtes-d'Armor has won the National Board of Towns and Villages in bloom certification in 1996, 2001 and 2007. The north west coast is known as the Pink Granite Coast reflecting the beautiful pink stones along the coastline – many of the houses are built from this stone. The most famous area for viewing the beauty and magnificence of the pink granite is Ploumanac’h with other good sites to be found between Trébeurden and Perros-Guirec. In contrast the north east coast is known as the Emerald Coast running from Val André to Ille et Vilain. The wild cliffs and rocky outcrops with some sandy beach areas are reminiscent of areas of Cornwall. Although St Brieuc is an industrial city, the old town does have attractive streets and good shopping areas. The city hosts numerous cultural events and festivals and is bustling during the popular rock festival, the Festival of Breton Music in late September. Dinan is a city to be explored on foot. With the ancient castle and ramparts, history abounds. The narrow, cobbled streets offer the walker many different shops to browse in and the river area has many restaurants and cafes. Dinan sits on the river Rance. The houses of the old town are altogether behind the ramparts. Dinan is quite a hilly city – if the hills prove to be too much there is a small train that runs from the tourist office to the port. There is a weekly market on a Thursday. The commercial sector of Lannion has become known for telecommunications. The old town has attractive, narrow streets which run down to the river - the old architecture has been preserved wherever restorations have been made. There is a full market on a Thursday and also a fish market each morning from Tuesday to Saturday in the Halle aux Poissons. If driving to Guingamp, look out for the Warenghem Breton whisky distillery which makes and interesting stop off on the way. The town has a youthful culture and atmosphere with plenty of nightlife and bars, probably due to the university. The central area, the Place du Centre, is pedestrianised and surrounded by old houses and hotels many with traditional wood and slate facades. In August, the Fête de la Saint Loup lasts for a week with folk dancing in the streets. 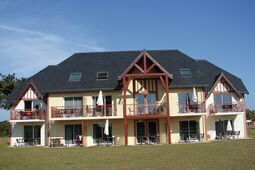 Holiday accommodation in Côtes-d'Armor is easily accessible. St Brieuc has a small airport with a small aircraft flight from Newquay. Dinard has an international airport and Air France operate from Lannion. 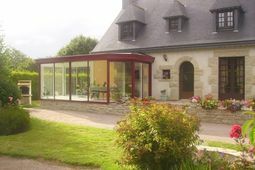 The area has good road connections and is served by the E50 and E401motorways, and is close to ferry links at St Malo and Roscoff. The TGV runs from Paris to Brest servicing the area with around 10 trains per day.